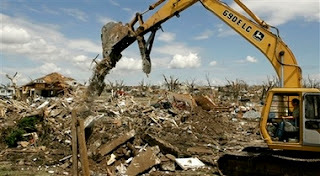 Greensburg, Kansas, U.S. - Volunteer emergency relief workers affiliated with the anarchist Kansas Mutual Aid (KMA) group have been told by law enforcement authorities that they are not welcome in the town of Greensburg, which was leveled by a Tornado on May 6th. The KMA relief workers were coordinating their efforts with the AmeriCorps and a local Mennonite church and had just received permission to set up a base of operations on private land when they were approached by police officers from a number of different agencies including the Kansas Bureau of Investigation, Olathe Police Department, Dickinson County Sheriff's Department and the Lawrence Police Department. Officers informed the volunteers that they knew who they were and what they were up to and ordered the group to leave town and not return. Police said that the group had been deemed a "security threat" and threatened that if any members of KMA were to return they may be "disappeared."